Flanked by the Pyrenes Mountains and bathed by the Mediterranean Sea, this region occupies the north eastern part of the peninsula. It has a strong identity, with a unique culture and language all its own. It is a highly developed region with great dynamism. With 6 million inhabitants, it is the second most populated region in Spain, after Andalucia. Barcelona is the historical capital of Cataluña and Spain's second leading city in both size and importance, after Madrid. Its port is one of the most important on the Mediterranean Sea. The city, exceptionally beautiful, has an impressive architectural heritage that includes the Gothic Quarter, with its cathedral, the old City Hall Building, the Episcopal Palace and the splendid Palace of the Generalitat, the site of the Catalan government. The city also boasts the work of the incomparable modernist architect Antonio Gaudi, who graced Barcelona with the better share of his many works of exceptional genius. Among them are the unfinished Church of the Sacred Family, G?ll Park, the Batll Home and the Mil Home. Barcelona also has many museums, two of which are the Picasso Museum and the Museum of Catalan Art. Lleida, capital of the province of the same name, is set on a steep slope that culminates in the grandiose citadel, in the centre of which is the "Seo", or cathedral, built between the 12th and 15th centuries. 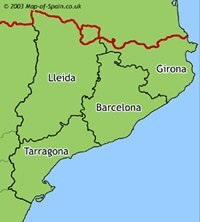 Find more information on Lleida here. Girona, capital of the province of the same name, it is one of the oldest and most beautiful Catalan cities, with a particularly interesting Jewish Quarter. Figueres, the birthplace of Salvador Dali, with a grandiose museum that brings together the better part of his finest work. Empuries is a Greco-Roman city that has preserved magnificent classical vestiges. Tarragona, the capital of the province of the same name. Of great importance in classical antiquity, the city preserves numerous vestiges of Tarraco, the original Roman city, some of which are the aqueduct, the amphitheatre and, on the coast, the so-called Tomb of the "Escipiones". Located closely together a few kilometres inland from Tarragona are two important medieval monasteries, Santes Creus and Santa Maria de Poblet, one the Pantheon of the Aragonese Kings. Sitges, an important tourist centre, offers several interesting museums, especially that of Cau-Ferrat, which has two paintings by El Greco. what tours we have available here! Popular tours sell out well in advance! Don't be disappointed! Reduce stress! Don't waste time haggling with the hotel concierge. Lock in your price! Currency dips & price hikes won't effect you. Save vacation time! Plan & book now, not when you're there. Balance your vacation budget! Charge tours on this month's credit card bill.